China takes over the World – Myth or reality? | China takes over the World – Myth or reality? Western rhetoric suggests that China’s economic success, its huge currency reserves, increasing foreign direct investment, and its growing international influence and ownership of foreign companies pose a profound threat to the balance of power within the global economy. But is this widely held perception true, or does it present a distorted picture of the country’s development and impact? 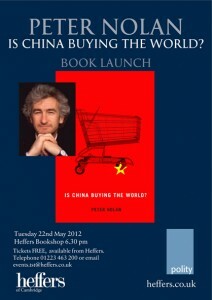 Peter Nolan is centrally involved in discussions about the integration of China with the global economy, and has been described by the FT as ‘knowing more about Chinese companies and their international competition than anyone else on earth, including in China’. He holds the Chong Hua Chair in Chinese Development at the University of Cambridge, is the Director of the Chinese Executive Leadership Programme (CELP), and has written over a dozen books about the country, the latest of which Is China Buying the World? was published last year. This entry was posted in 2013, Audio and tagged Peter Nolan. Bookmark the permalink.